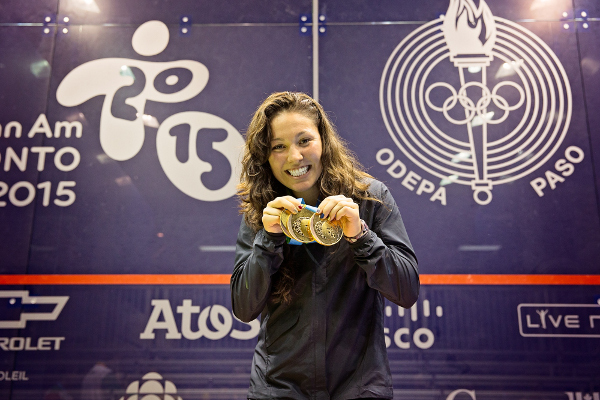 July 29, 2015 – 2011 North Shore High School graduate Amanda Sobhy added golden luster to her achievements as the USA’s best squash player when she made sports history in July by becoming the first squash player to win three gold medals at the Pan American Games. Making her Pan Am Games debut in Toronto, the reigning and two-time national champion started her gold medal campaign by defeating teammate Olivia Blatchford in the singles final and followed up by capturing the doubles title with partner Natalie Grainger. 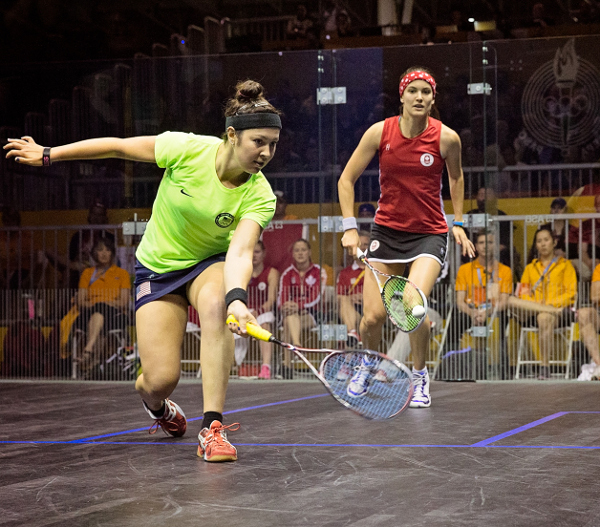 Sobhy closed out her golden sweep, which required her to play 11 matches in six days, by leading the US to victory in the team event as she and Blatchford notched victories to defeat host team Canada. Immediately after the Games, Sobhy spent time with family and friends in Sea Cliff, where she loves going to the beach and paddle boarding. The US squash star, who graduated in May from Harvard University where she majored in social anthropology and was undefeated in four years of intercollegiate squash play, won’t be resting on her laurels. She is fully committed now to her new career as a touring professional squash player. Sobhy’s love of travel will certainly be fulfilled as she competes on the women’s international Professional Squash Association tour. In the upcoming five months, she will play tournaments in China, San Francisco, Philadelphia, Monte Carlo, Hong Kong, Qatar and Malaysia before returning to New York City in January for the J.P. Morgan Tournament of Champions in Grand Central Terminal. “I want to be world no. 1 and win the World Open,” Sobhy declares. “I also want to make an impact on the sport – especially to help grow it in the US. “ As the highest-ranking American ever, world No. 10, in the Professional Squash Association rankings, and with three Pan Am gold medals around her neck, Sobhy is well on her way. USA's Amanda Sobhy (l) defeating Canadian Samantha Cornett (r) at the Pan American Games.